Hitting the water with your favorite kayak is a source of thrill and excitement all the time. If you are a dog lover and want to make your kayak journey more exciting and enjoyable, then your dog will be a perfect companion for this kind of adventures. Bringing such best buddy always make your kayaking much more exciting. They only stay with you and love you without any complaints. So, if you want to bring your dog with you and want to know how would you do that, keep reading! Bring Your Best Buddy with You and Never Feel Lonely! It’s no more secret that dogs are one of the best partners out there. Their world revolves around us. They love us with their whole heart. Let’s admit it; it feels lonely sometimes while kayaking in a large river all by yourself. Your dog, sitting in the home and waiting for you to come back, is also missing you. Why not bring him and make both of you happy?! Whenever you leave, your dog makes a sad face. You don’t want to leave him behind either. Instead, take him with you! Fresh air is good for his health. Swimming is another reason to bring your dog with you. It’s a good exercise. Here a crucial thing to consider that many dogs don’t respond positively to swimming. If your dog likes swimming, take him kayaking. It’ll be memorable for both of you. Kayaking is challenging, and there are tough times we go through. You’ll feel relaxed if your dog is accompanying you. Maybe it’s just a little weekend, and you are kayaking for pleasure. Bringing your dog will make it much more fun! If it’s cold, cuddling will keep both of you warm, and bring an excellent sense of safety. In summer, kayaking and swimming with your dog will help to freshen up. Is Kayaking Right for Your Dog? You really want to take your dog with you, okay! However, think logically, is it feasible after all? Size and Weight of the Dog – A very large-sized dog, whose weight is 100 pounds or more, is usually not considered ideal for kayaking. It will be very challenging for you to fit him in the boat and keep paddling for a long time. Behavior – If your dog can’t sit for long periods and jumps around all the time, it may capsize the kayak. You’ll find it hard to keep the dog calm and paddle at the same time. Physical Fitness – Health issues cannot be ignored. If your dog is old, suffering from arthritis or hearing problem, or may be visually impaired, it’s never the right decision to take the dog for kayaking. Make Your Dog Familiar with the Kayak – Bring the kayak home and let your dog play with it. Don’t just bring him for kayaking for the first time, and expect him to act normally after seeing a giant kayak. Make him familiar with it before the journey. Hopefully, he won’t be nervous later. During kayaking, dogs encounter a lot of fascinating things. They may want to get those by jumping into the water. In such situations, you have to command him to leave it and stay on-board. Lightweight Kayak with Good Weight Capacity – Heavy boats usually don’t offer good weight-capacity. When you are kayaking with your dog, choosing a kayak with considerable weight-capacity is a must. Better opt for lightweight kayaks that have better capacity. 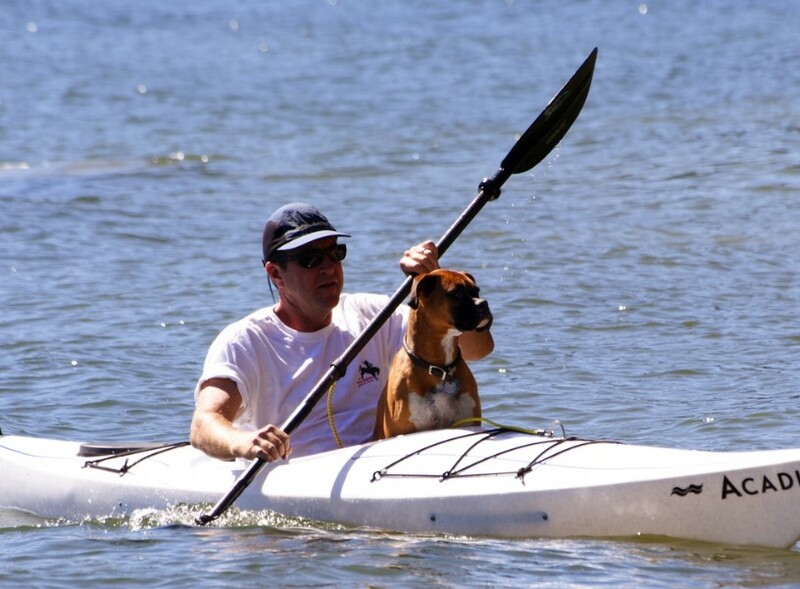 Large-sized Kayak for More Space – If your dog is large, you will need a large-sized kayak. If he is small, having a large kayak still pays. Getting more space helps you to bring important stuff with you. Stable Kayak for Safety – Try to find out stable kayaks, that won’t capsize in the blink of an eye. Remember, bringing your dog with you will add extra weight and movement to the kayak. So, you should pick the stable one to keep the journey safe. Let the vet know that you are going for kayaking with your dog. The vet may offer some precautions and medicines. If you frequently go for kayaking with your dog, you should be careful about mosquitoes. It’s better to have heartworm prevention for your dog. If your dog is suffering from fever, especially after returning from the kayaking, consult with a vet ASAP. Taking such kind of fever seriously from the beginning can reduce your dog’s pain and lots of your sufferings. Put life vest on your dog. Yes, most of the dogs are natural swimmers, but not all. Even dogs can drown in the water. Some dogs are afraid of water and don’t want to touch it. Freshwater for both of you to avoid dehydration. Snacks to eat when you are hungry and tired. Poop bag for your dog to carry and bury. Water toys for your dog to play with. Sunscreen to prevent the sunburn. For overnight trips, a tent for you and a bed for your dog. Bring a leash to keep your dog closer to you, but NEVER tie him with the kayak. If the kayak capsizes, it can be deadly for your dog. Try to paddle slowly. A fast-paced kayak may scare your dog, and the dog may do something unusual that can violate the safety. Put an additional harness on your dog despite the collar. It helps to bring the dog back to the kayak if he slips out. Take good care of your dog’s paws. Salty water can cause problems. Before starting the journey, trimming toenails can prevent scratches. It’s always a good idea to bring one of your friends, especially if you are kayaking with your dog for the first time. If anything goes wrong, there will be someone for help. Kayaking can be one of the best things out there for your pup if it’s done right. Train your dog effectively, follow the safety measures, and bring essential equipment with you, your journey will be unforgettable! Kayaking with your dog can be very relaxing and will make your bond stronger. This peaceful journey is an incredible way to explore the water for adventure with your buddy. Go, grab this fantastic opportunity! Rock Climbing Equipment Rock climbing is a dangerous sport and grueling activity.